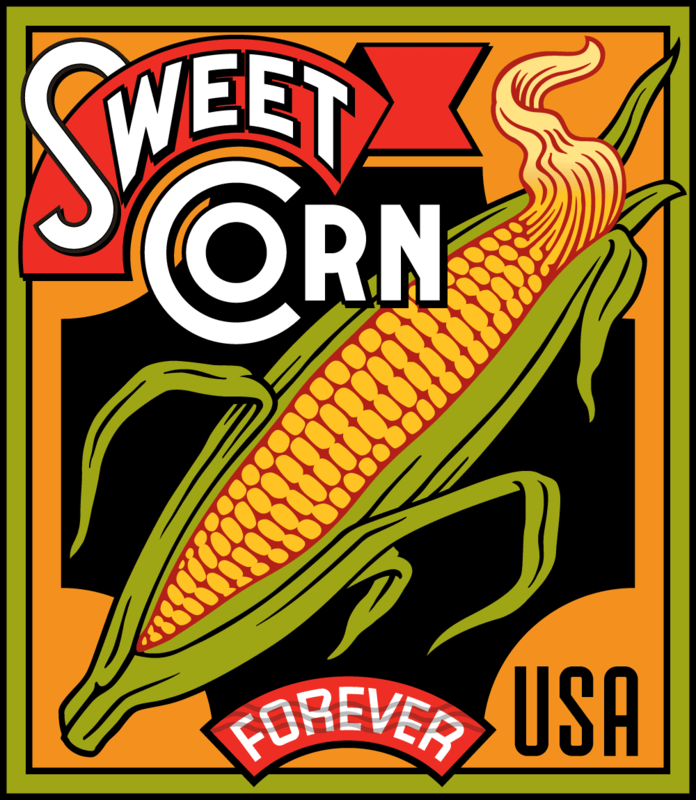 It turned out that because we were keeping the basic design for Sweet Corn, that design also served as a template for the others as well. 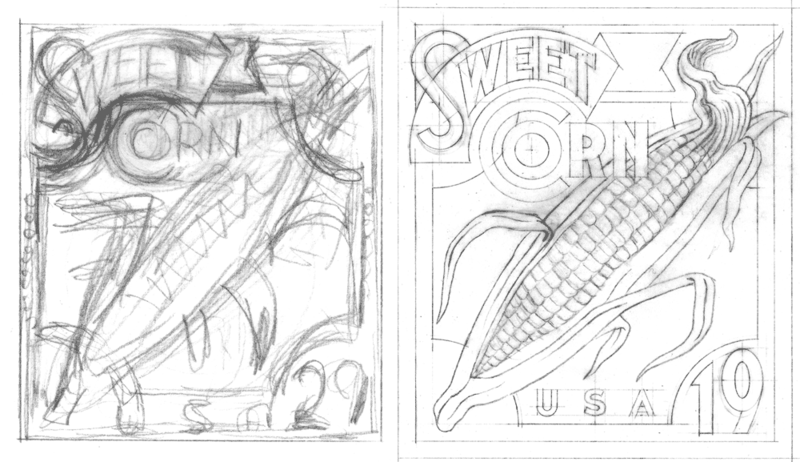 Starting with the original Sweet Corn design from 2002 (below at upper left), here are a sampling of a few of the iterations as they progressed—with the final approved design at the bottom. 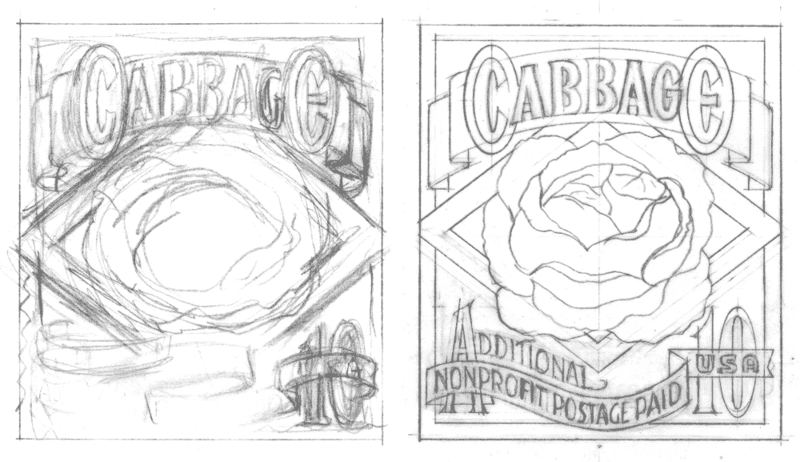 In the end the palette changed to one which could be applied to all the stamp designs. 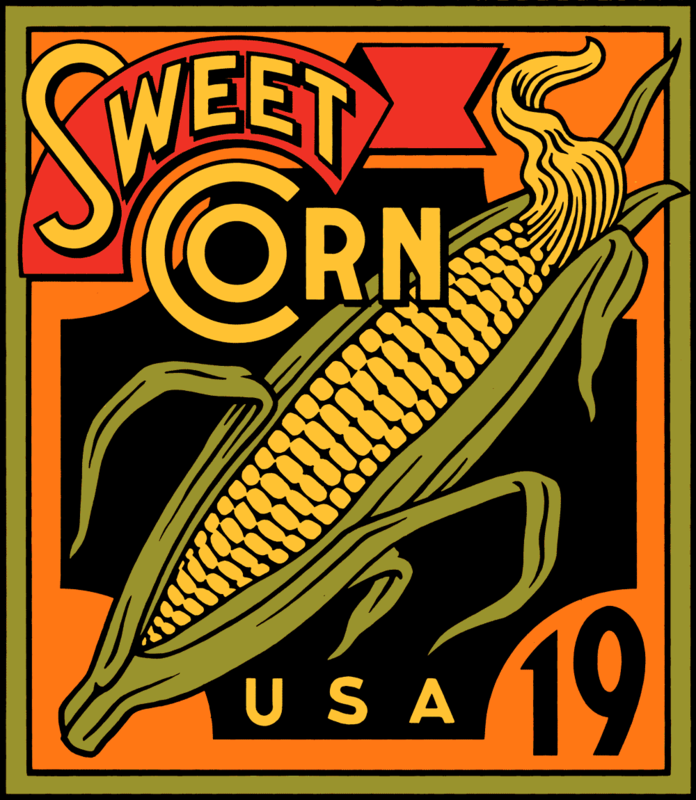 Also, note that the Sweet Corn lettering is a bit bolder on the final design (below), making it a bit more legible at the stamp’s small reproduction size. 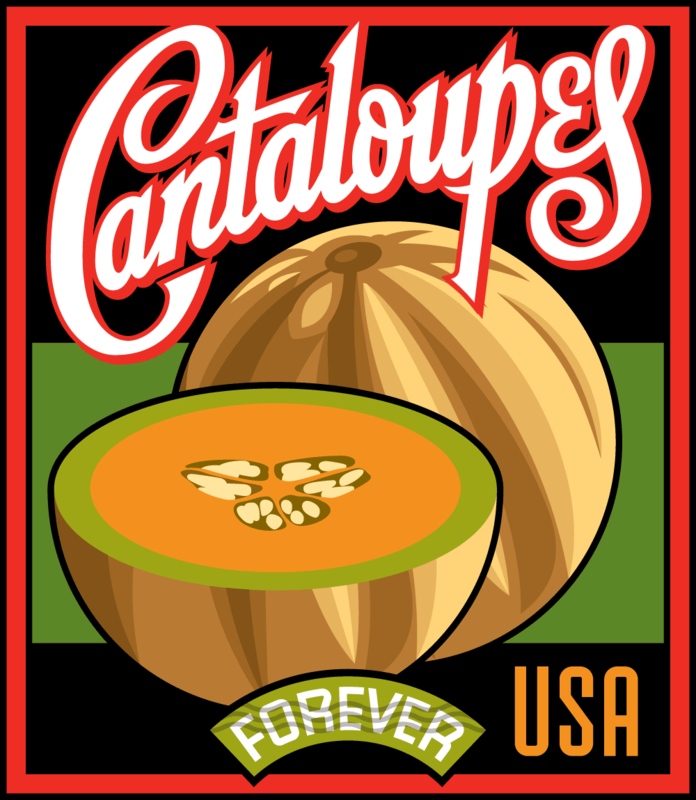 Before I had gone that far with it, the stamp depicting Squash was (pun intended) squashed. This was as far as I got before Squash was eliminated from the group. 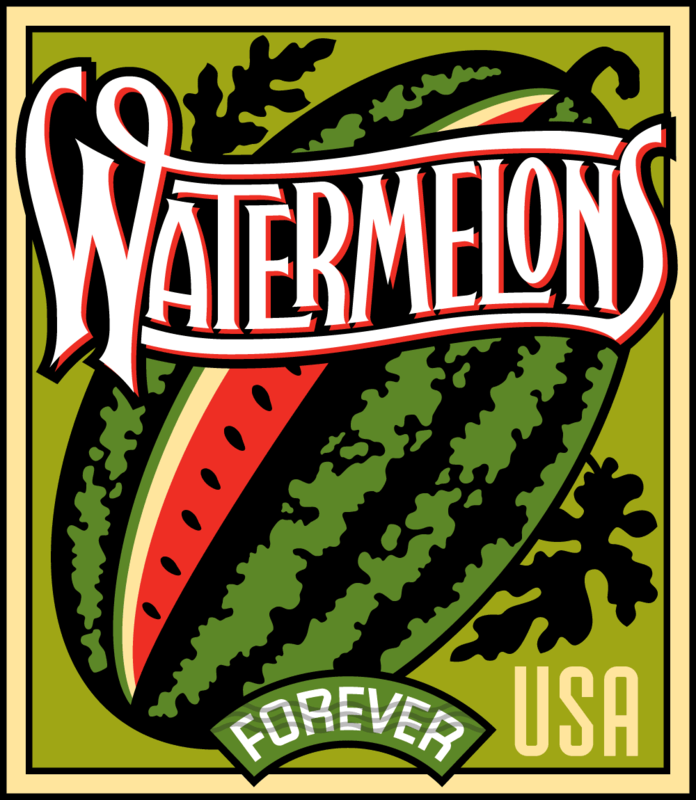 The Watermelons design was a bit more problematic than the others. 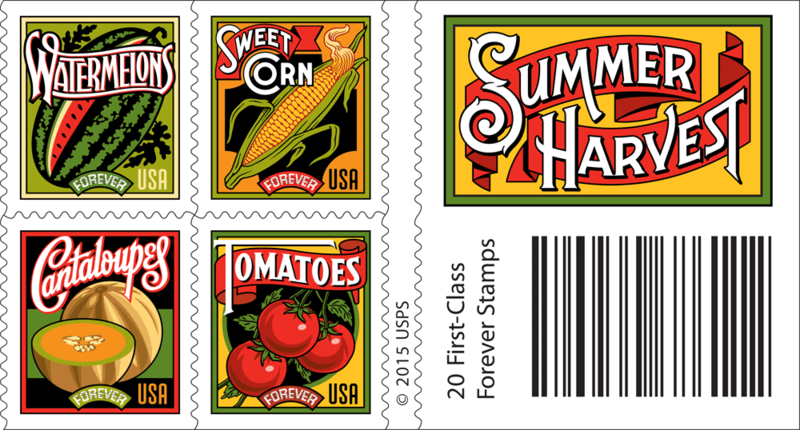 For some reason the layout depicting a vertically oriented watermelon with a slice in front did not meet with USPS approval. So I opted for the more traditional approach with the watermelon leaning at an angle. 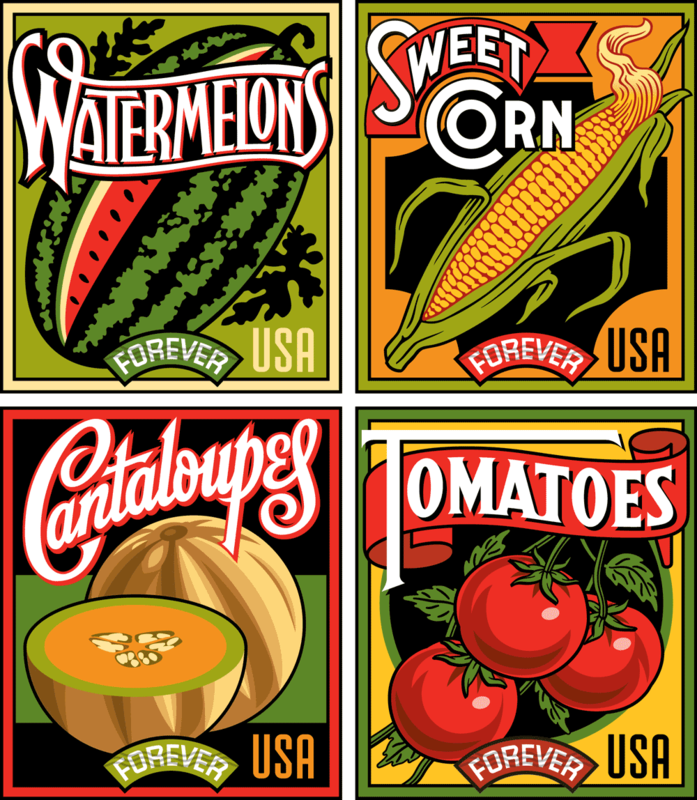 Another problem was the length of the word “Watermelons”: I needed to really condense and overlap the letters so that they would be legible at the tiny size they would reproduce. 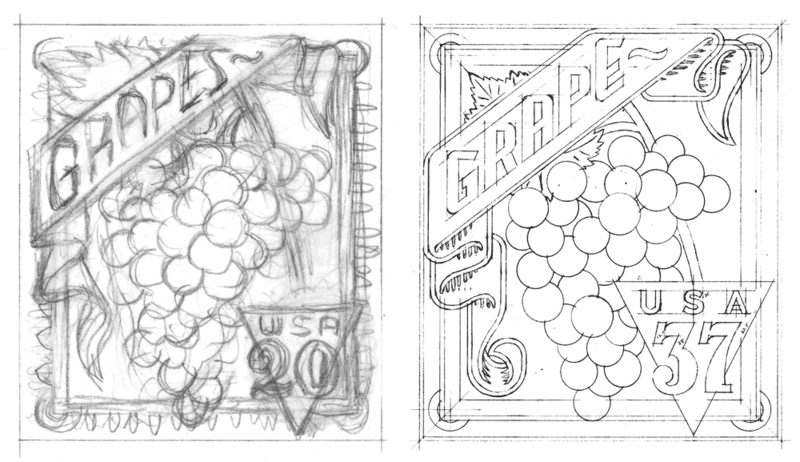 Also, it was felt that in the earlier iterations the letters were a bit too pointy, and so you can see those modifications in the later stages. 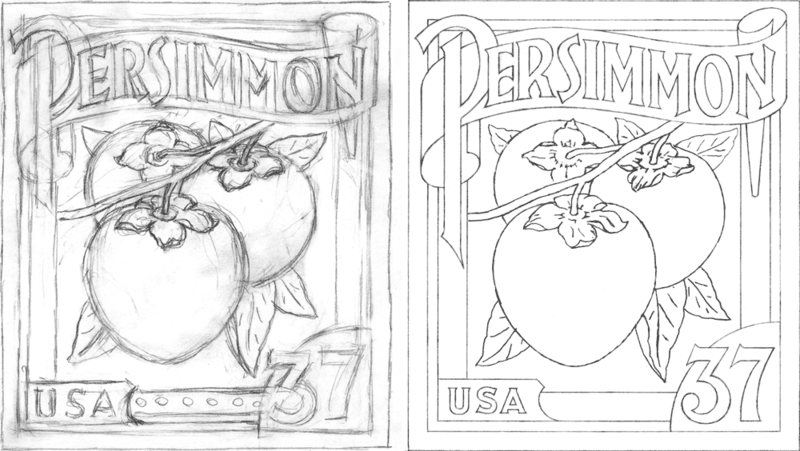 In addition to re-using the Sweet Corn design from the ill-fated 2002 set I also saw the opportunity to recycle the earlier design for Persimmon. It seemed perfectly suited to adapt for Tomatoes. This design then came together fairly quickly. 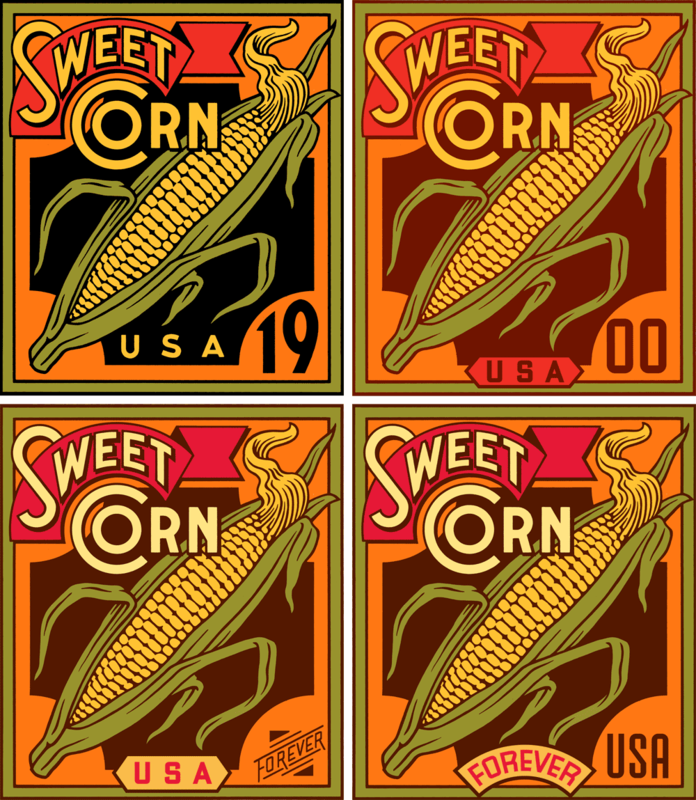 The two smaller color versions (below at lower right) may seem quite similar, but they have several important differences: 1) the background color on the later design is brighter, to be more in line with Sweet Corn, 2) the shading on the two tomoatoes on the right changes a bit, and 3) I re-did the leaves with more detail where the branches meet the tomatoes. 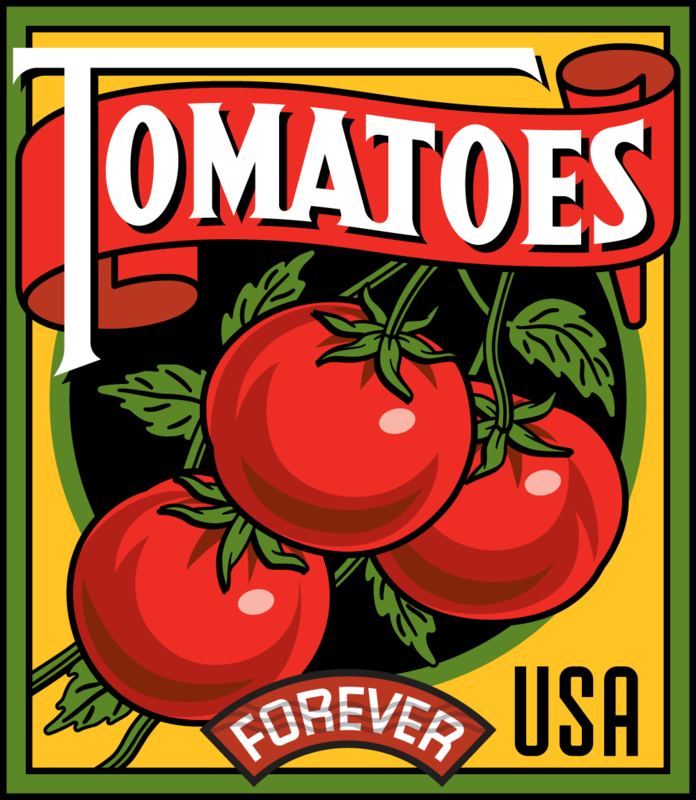 A significant difference in the final version of Tomatoes is that I reversed the colors of the type so that now all four of the stamps had white type (for consitency). 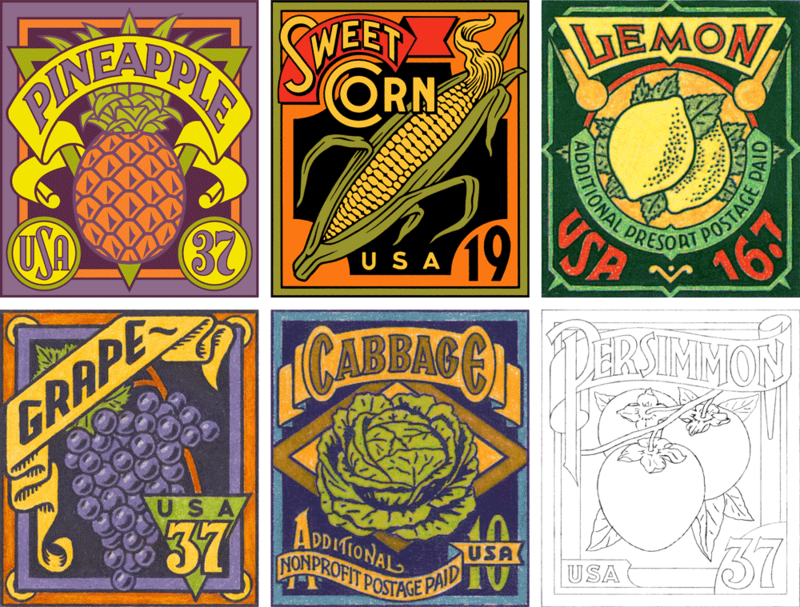 What I gleaned from all the reference was not so much layout and design, but more the attitude of these graphics—and how the various fruits and vegetables were represented. 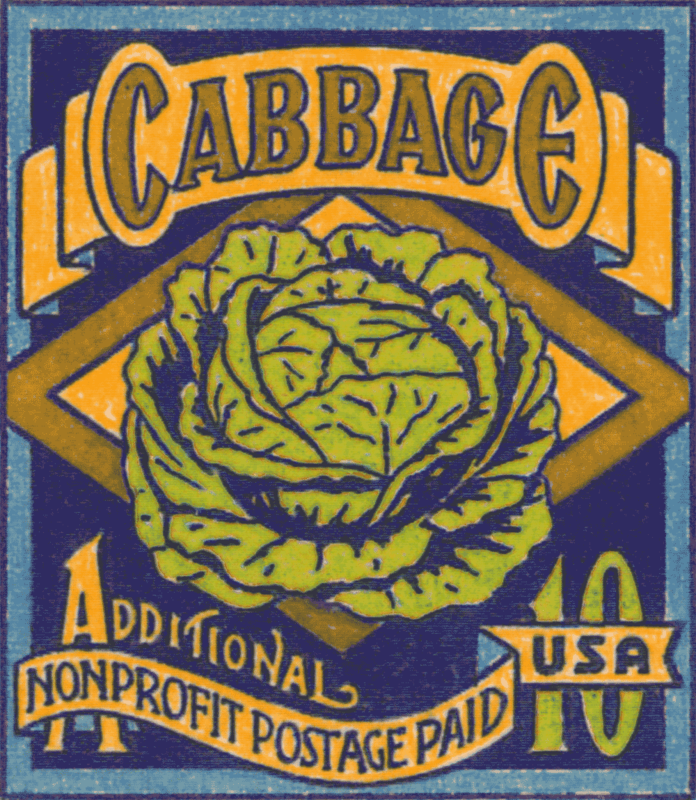 I was not trying so much to do faithful renditions of seed packets or fruit crate labels, but to create graphics that might be seen as contemporary versions of their earlier cousins. So I never borrowed any of the elements from the earlier graphics verbatim, but attempted to update them to a more current sensibility. 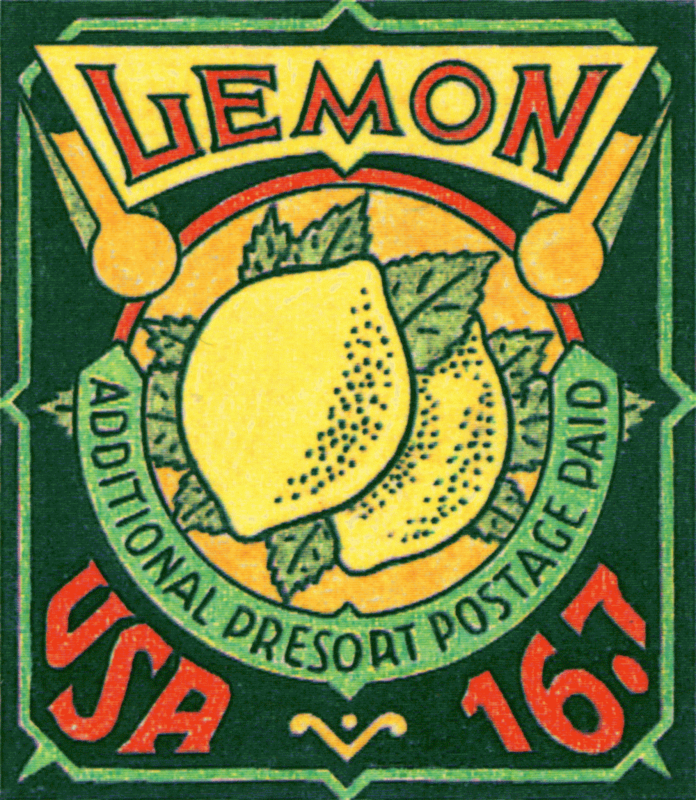 Also the small size and scale of these stamps prohibited using the reference in a very literal manner: reducing any one of them to the size of one of these stamps would have rendered much of their fine detail unreadable. So I needed to play loosely with the idea of referencing these graphics, making them much bolder and simpler than one might have imagined. 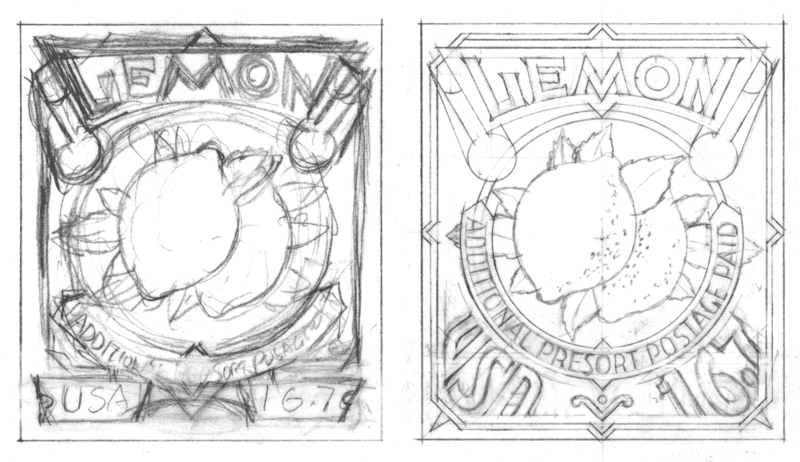 Here are the six stamp designs I created in 2002 preceded in each instance by a couple of the pencil drawings created in their development. 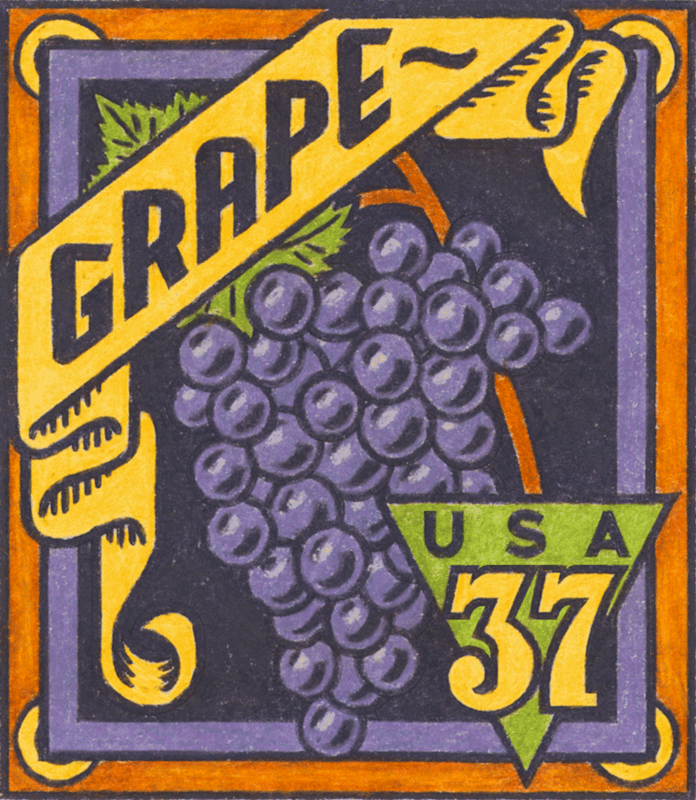 Of the six, these first three—Grape, Cabbage and Lemon only made it to the colored pencil comp stage (yes, back in 2002 I still occasionally did color comps the old-fashioned way—by hand!). 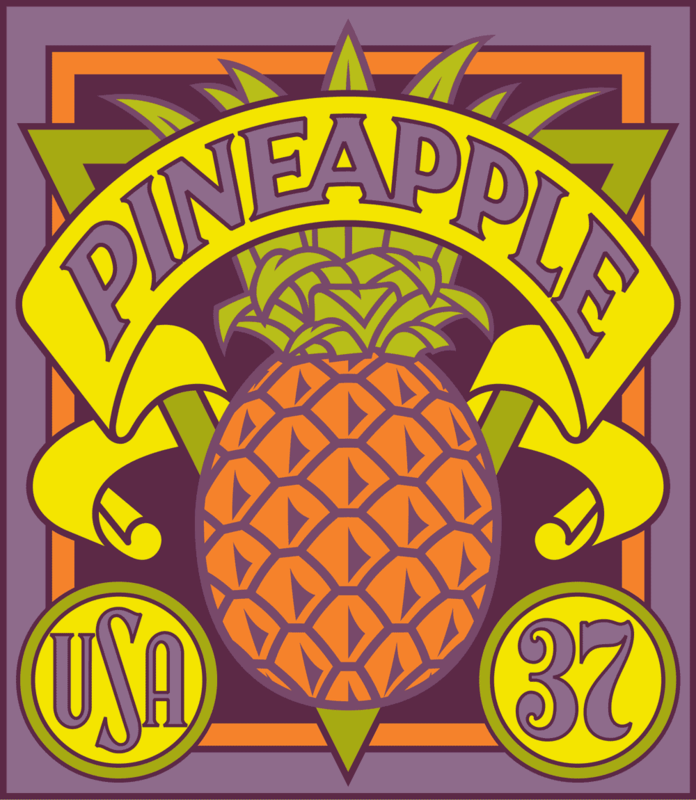 The following two designs—Pineapple and Sweet Corn—were developed to a more finished, digital stage, and so were more refined and worked out than the preceding three designs. But things don’t always turn out as you would imagine. I never felt that I should have given up hope for these designs . . . so in 2012 an opportunity presented itself with regard to these designs that I couldn’t ignore. If you’d like to know what happened, please check out Part 2 of this post. In Part 1 of this post I outlined this project from inception until completion of the finished art. 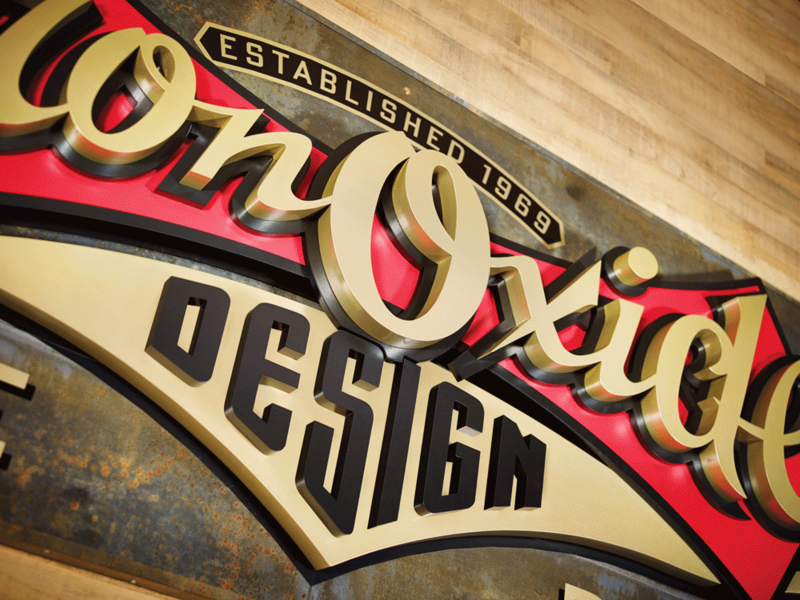 But the part that was the most fun for me was when that artwork was finally placed in the client’s hands—a client who himself is a master signmaker, and who had ideas about how to take the design to the next level. I had never worked with someone like that, and was anxious to see how my art would be interpreted by such a craftsman. Because I was unable to be up there in Canada to see the fabrication first-hand, I asked Blaine Casson to photographically document the different stages of his project. In the end the final photos of the finished signs were taken by Blaine’s good friend, photographer Bryn Gladding. 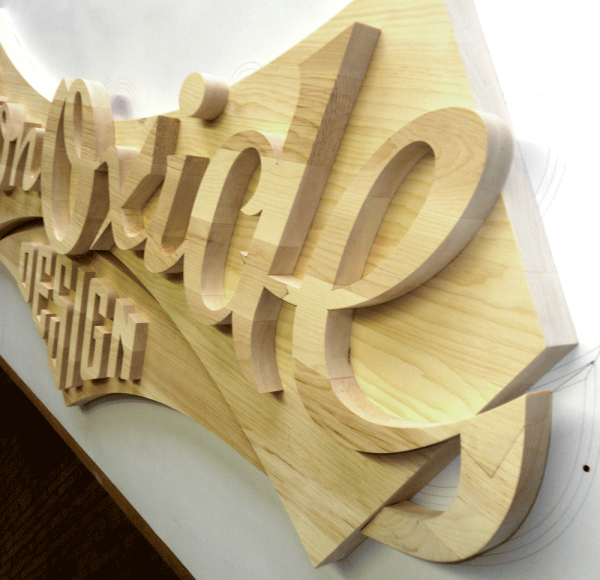 Following are Blaine’s notes on how he translated my 2D art into 3D signage. “With no available drawings of the 105 year old building I began by photographing the destined sign location below one section of my third floor windows. I then scaled that photograph up, made a full size card pattern and checked it in the installation area to prove out the dimensions and arch shape. 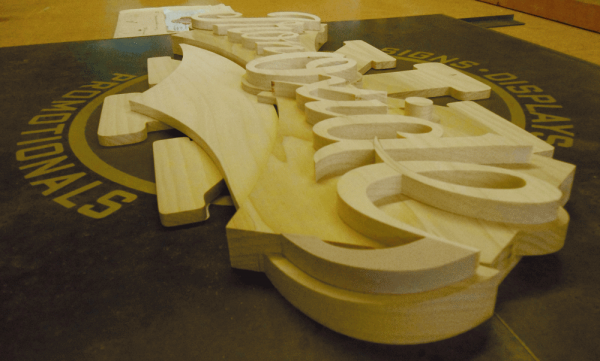 “It was decided that the full version of the logo would not work well in this space so I made a scale model of the sign blank for Michael. I sent him vector art of the sign blank shape and dictated the background of the sign would be oxidized metal sheets and that his Iron Oxide script was already committed to be 80″ wide. Michael took over the design from there and I began to plot out full size paper patterns of the script and it’s background shield. 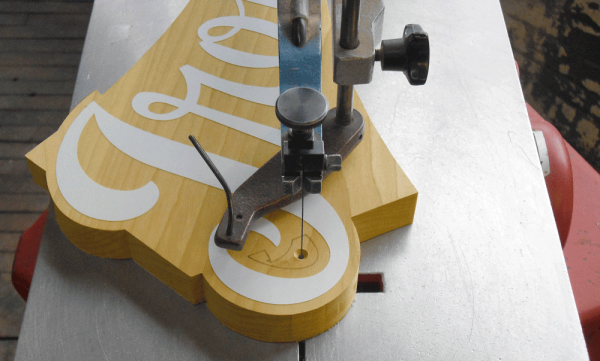 “I milled rough cut select Pine, glued and clamped it up into oversize blanks for the different layers that I had decided to use in the multi-layered three-dimensional logo script. As my sign was on a third floor in height and to be viewed from about 150 feet away I thought that to really convey the three-dimensional effect I was after I would have to be aggressive and chose to over compensate in layers and thickness. 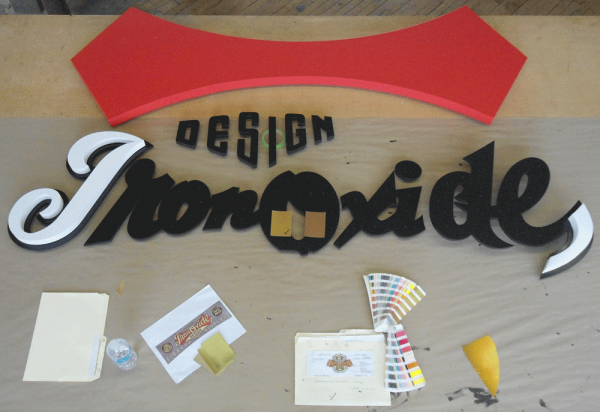 I assigned the first layer to the metal clad sign blank then broke Michael’s vector art up into the red shield and the gold tail of the “e”. These were on the same plane but of different thicknesses. 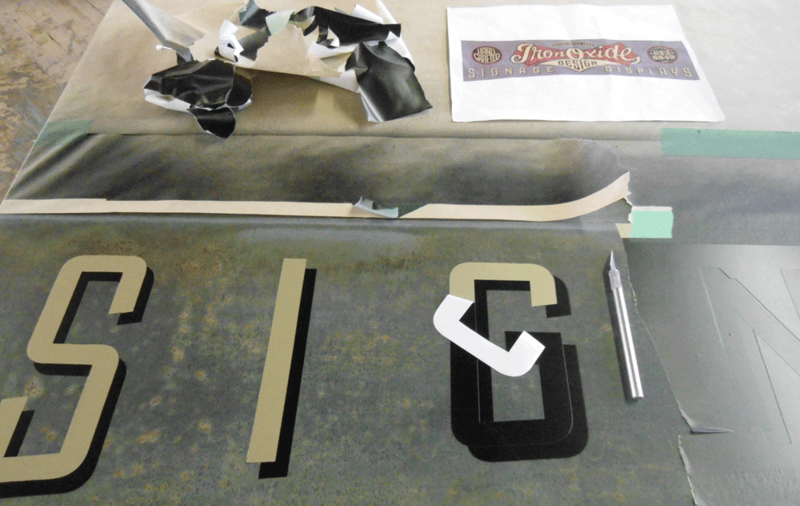 Next layer would yield the black outline of the Iron Oxide script and finally the actual cut out script characters. 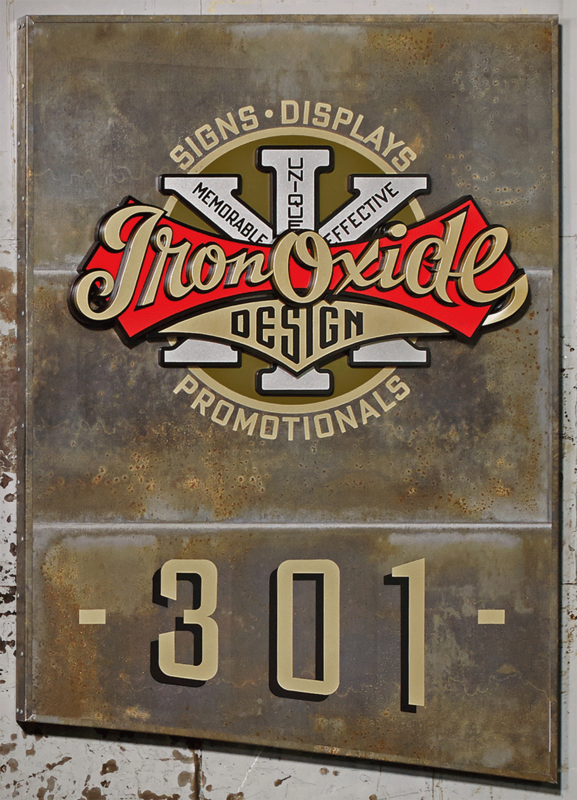 The pending design copy from Michael would be painted directly onto the oxidized metal background. 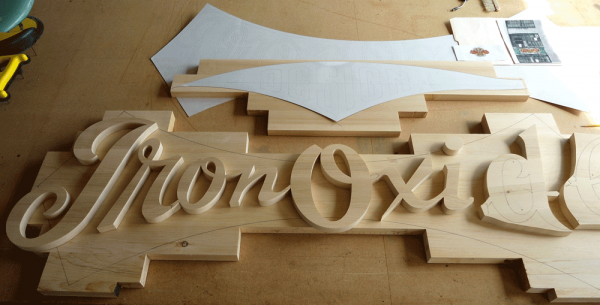 “Patterns now generated, I transfered them to my Pine blanks and cut out all the individual letters and logo elements using either my 50 year old Oliver pattern makers scroll saw or my slightly more modern Hegner scroll saw. Vector art was flawless, so it was just a matter of splitting that pencil line as I cut. 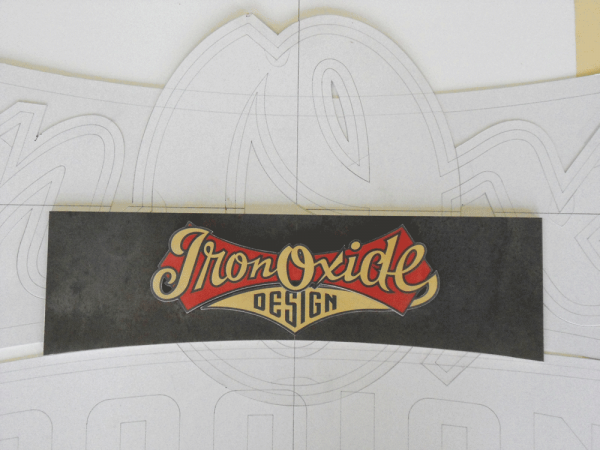 “Translating Michael’s logo design into the three-dimensional realm was simple enough but proved a little time consuming at the stage where I had to descend the tail of the “e” by 2″ from the script layer to the metal sign blank layer. As well, it had to pass under and through the red shield. 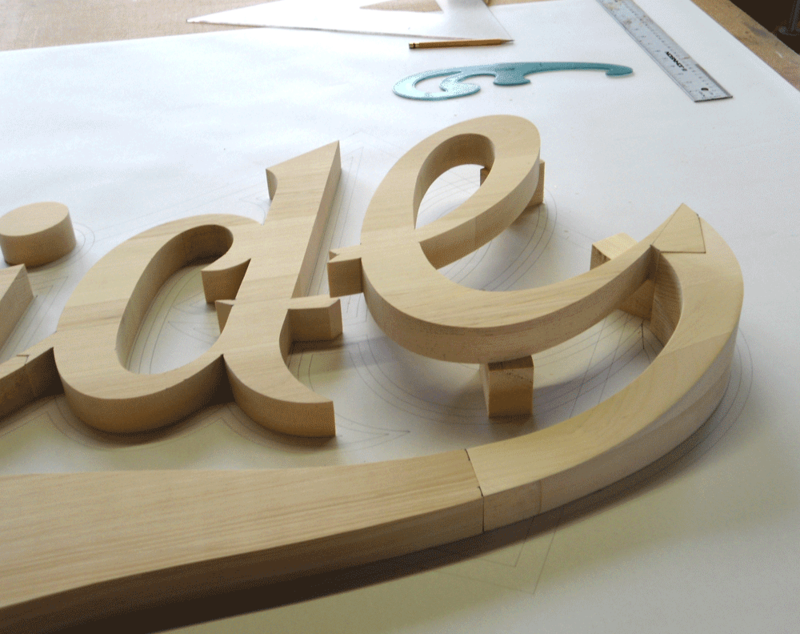 I built up wood on the end of the “e” and between the band saw, chisels and plenty of hand sanding I was able to fashion the profile. I routed a path in the underside of the red shield to accommodate the tail. Et voila! 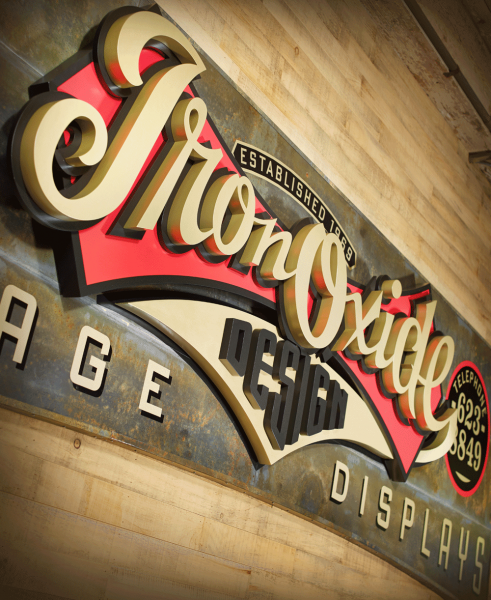 The finished sign finally emerges. The following photos were taken indoors by Bryn Gladding, prior to exterior installation. The making of the IRON OXIDE DESIGN interior door sign. Three-dimensional. 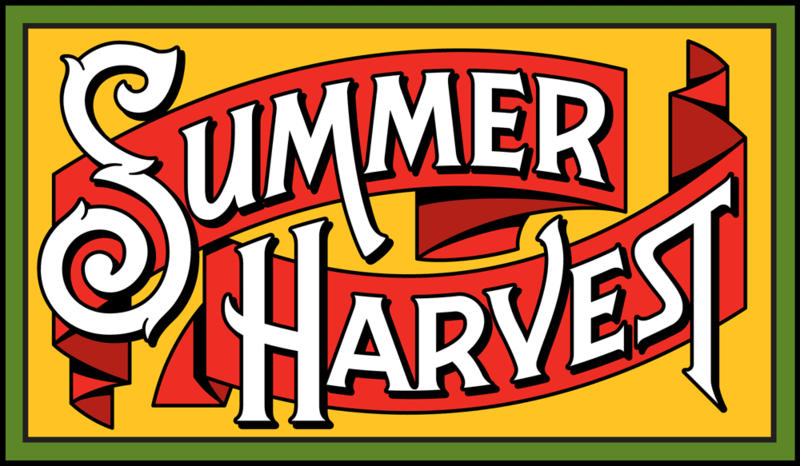 28″ wide x 40 1/2″ high x 3″ thick. “Working in Poplar wood this time, the production of my interior door sign was basically a downsizing of the exterior fascia sign project. 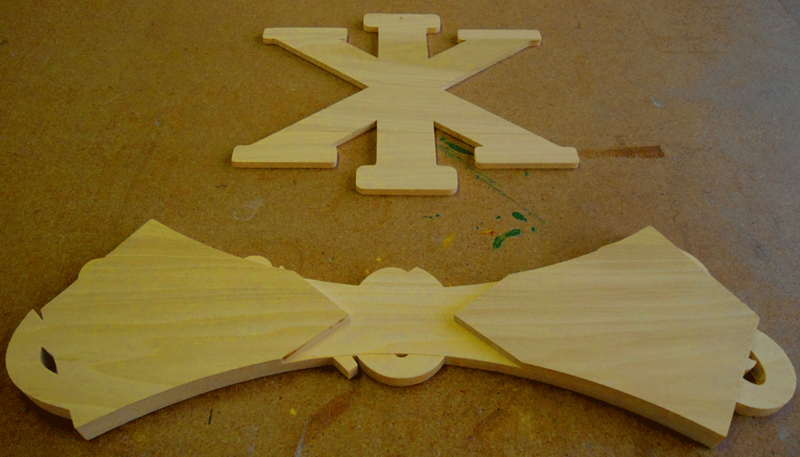 “I changed things a little bit given that this time I was reproducing the full “as designed” version of my logo. I eliminated the separate cut out layer for the script’s black outline and made it integral with the cut out shield layer, differentiated by painting the outline profile. I also painted “DESIGN” rather than individually cutting out the characters as I had on the fascia sign. Finally, below is the full version of the logo as used for interior signage in Blaine’s loft building.